The oxidative cleavage is the cleavage of the double bond in the alkene by oxidizing agents (such as KMnO4). Here comes to the complete cleavage of the double bond and the chain is interrupted or the cyclic compound opens. There are many reagents that will add across an alkene and completely cleave double bond. Potassium permanganate, KMnO4, is a powerful oxidizing agent and has many uses in organic chemistry. The products that are obtained can very be depending on the conditions, but because potassium permanganate is such a strong oxidizing agent, the final products are often carboxylic acids and ketones. Under the mild conditions, potassium permanganate can affect the conversation of alkenes to glycol. It is, however, capable of further oxidizing the glycol with cleavage of the carbon-carbon bond, so careful control of the reaction conditions is necessary. A cyclic manganese diester is an intermediate in these oxidations, which results in glycols formed by sin addition. Because potassium permanganate, which is purple, is reduced to manganese dioxide, which is a brown precipitate, any water-soluble compound that produces this color change when added to cold potassium permanganate must possess double or triple bonds. This reaction is referred to as the Baeyer test and it used as a color test for alkanes. With the addition of heat and/or more concentrated KMnO4, the glycol can be further oxidized, cleaving the carbon-carbon bond. This leads to the formation of the mixture of ketones and carboxylic acids. For the oxidative cleavage of the double bond of an alkene, often sodium periodate (NaIO4) is used. 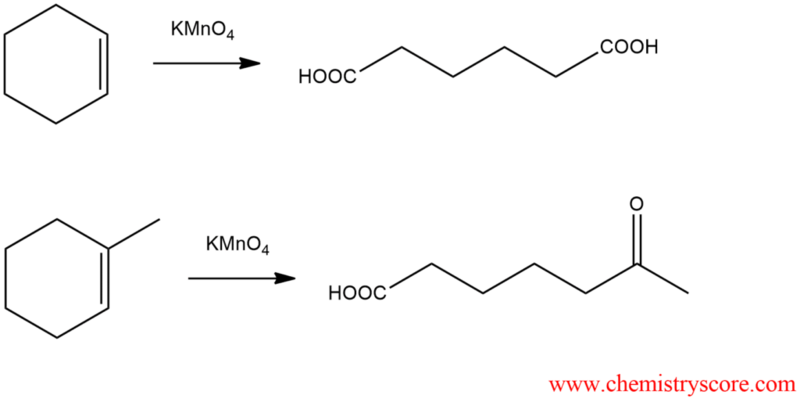 As products, aldehydes and ketones are obtained depending on what starting diol looks like.